Recently one of my friends decided to post everything she owned for sale on a facebook “garage sale” page. It kinda made me crazy! I didn’t want to buy any of her baby clothes or toys, etc… SO I hid her posts. I also messaged her that I did and that, when she was done selling stuff, let me know…because I really DID like keeping up with her via facebook. She changed her privacy settings on her posts. And let me know. I had to then figure out how to “unhide” her! Click “Most Recent” to expand a drop-down menu. A list of people, Pages and apps you’ve hidden will appear in a pop-up box. Click “x” next to each one you’d like to remove from this list. 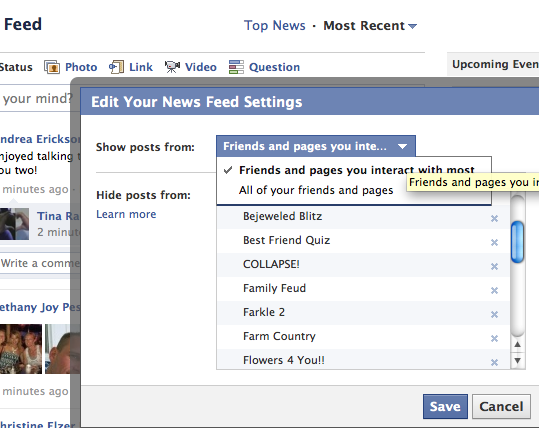 Removing a profile from your “Hidden” list means posts from that person or Page can appear in your News Feed again. You can also choose the all setting from the drop down. Posted by bethkolar on August 5, 2011 in Facebook and tagged facebook etiquette, hiding facebook posts, unhiding facebook posts.